Yvonne Sullivan Hacker, Age 79 A native of Ransom, Kentucky. 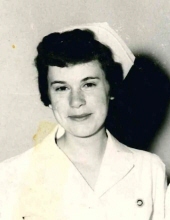 She was the daughter of Dorothy Mae Keesee and John L. Sullivan of Ransom, KY. She became a nurse for Providence Hospital and later Saad’s Healthcare. She met her gracious husband of 47 years, Mr. Frank Hacker. She is survived by her daughter Robin Thonpson of Fredericksburg, VA, two grand-children, two step-grand children, and two step-great grandsons. Other survivors includes: two sisters, Glenda Trotter and Shirley Scanlan from Montgomery, a brother, Ron Sullivan from Texas, a brother, Irvin Sullivan from South Carolina, extremely large extended family and countless friends. Graveside services will be held at noon on Friday, February 1, 2019 at Pine Crest West Cemetery. The eulogy will be provided by Rev. Eugene Freeland. A reception will follow at Our Savior Catholic Church on 1801 South Cody Road, Mobile, AL 36695. In lieu of flowers, memorials may be made to the American Cancer Society or flowers can be sent to Ascension Funeral Home at 1016 Hillcrest Road, Mobile, AL 36695. To plant a tree in memory of Yvonne Sullivan Hacker, please visit our Tribute Store. A Reception will follow the graveside service at Our Savior Catholic Church, 1801 South Cody Road, Mobile, Alabama 36695. "Email Address" would like to share the life celebration of Yvonne Sullivan Hacker. Click on the "link" to go to share a favorite memory or leave a condolence message for the family.